History repeats itself at the talented hands of collector, designer, and shop owner Julie Hendricksen as she inspires others to re-create and enjoy vintage stitchery. As a quilt shop owner, lecturer, and designer, Julie holds a unique position to share her love of antique quilts with others. With a private collection of antique quilts numbering upwards of 200, Julie often can’t resist the lure of an intriguing find with a memorable design, interesting colors, and many different fabrics. 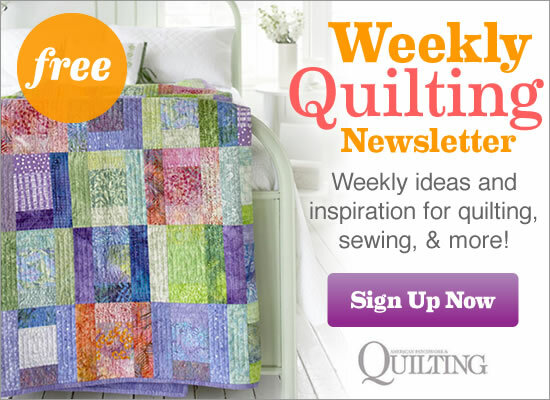 Julie encourages aspiring quilt collectors to display their finds. Log Cabins, Ocean Waves, Pinwheels, and basket and star quilts are everywhere in her home. If you can put something in it, on it, or under it, Julie’s filled it, draped it, or propped it up with a quilt. Vintage quilts in Julie’s collection are rolled, folded, or hung flat on the wall. Here, a basket of quilts and two Irish Chain quilts on a drying rack add a cozy touch to a bedroom corner. A $25 Irish Chain quilt found padding furniture at a flea market graces the foot of Julie’s iron bed. Neutral tones throughout the house accentuate her collection. Julie’s love of vintage goes beyond quilts. Here, a stash of miniature quilts, clothespins and an iron represent her passion for antiques. Although the first quilt in Julie’s collection was an appliquéd Sunbonnet Sue, most of her quilts are pieced. Shown top to bottom are Thousand Pyramids, Wedding Ring, and Martha Washington Star. “I don’t think the quilts I’m buying are necessarily museum-quality pieces,” Julie explains, “but I’m not careless with them.” She rarely cleans an antique quilt, although if it is extremely dirty, she soaks it in the washing machine without agitation in mild, quilt-friendly soap. If they’re on beds, they’re folded back at night.